My Alzheimer’s Dad (89) has enjoyed Assisted Living for two years. Now I can’t even visit him because halfway through the visit he starts screaming, “You stole my money.” In reality, I spent my own money until he was comfortable enough to give me control of his and even paid rent to keep his apartment “just in case” he improved enough to go home. Now I cry all the time. I love him and I’ve hurt him. Should I bring him to live with me? You didn’t hurt dad, Alzheimer’s disease did. If dad needed assisted living two years ago, bringing him to live with you now isn’t realistic. 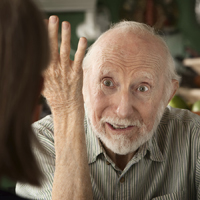 Behavior management is one of the most difficult tasks Alzheimer’s caregivers face. Dad needs an Alzheimer’s specialist to determine the cause and treat his aggressive behavior. The road to peace of mind begins with calling the experts at Alzheimer’s Community Care (772-223-6351 (Martin772-223-6351/St. Lucie- 772-460-9166; Ft. Pierce- 772 466-3261); the Alzheimer’s Assn. (800-272-3900), or Alzheimer’s/Parkinson’s Assn. (Vero 772-563-0505) for help.